Point Pleasant senior Alex Warden, left, clears the ball away from a Nitro attacker during the first half of a Class AA-A Region 4, Section 1 championship match in Nitro, W.Va.
NITRO, W.Va. — It certainly wasn’t for a lack of effort. 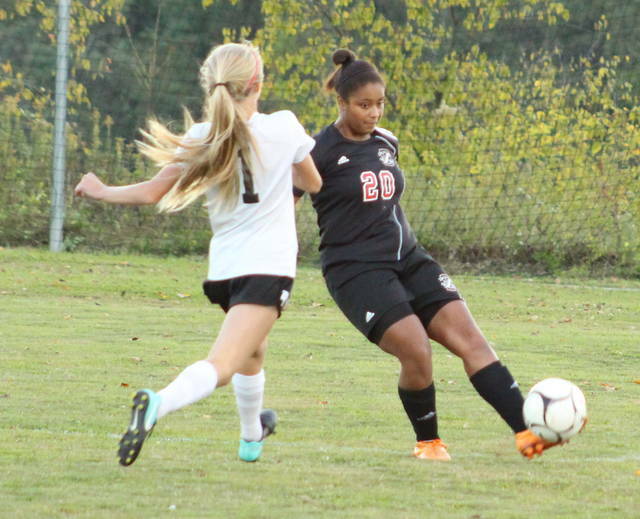 The Point Pleasant girls soccer team gave top-seeded Nitro all it could handle for 80 minutes, but the hosts ultimately held on for a 2-1 victory Thursday night in a Class AA-A Region IV, Section 1 championship match in Kanawha County. The second-seeded Lady Knights (6-9-3) never led in the contest, even though the guests posted a considerable 19-10 edge in shot attempts and a 14-6 advantage in shots on goal. 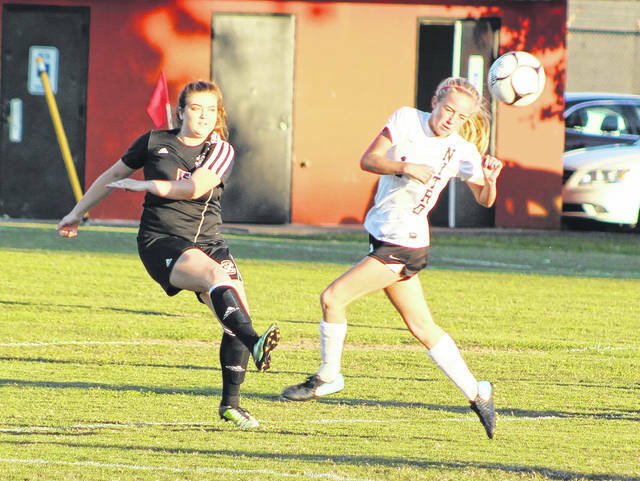 For a second straight postseason game, the Lady Knights maintained control in their offensive third — which led to multiple scoring opportunities that mostly came up short on those numerous occasions. 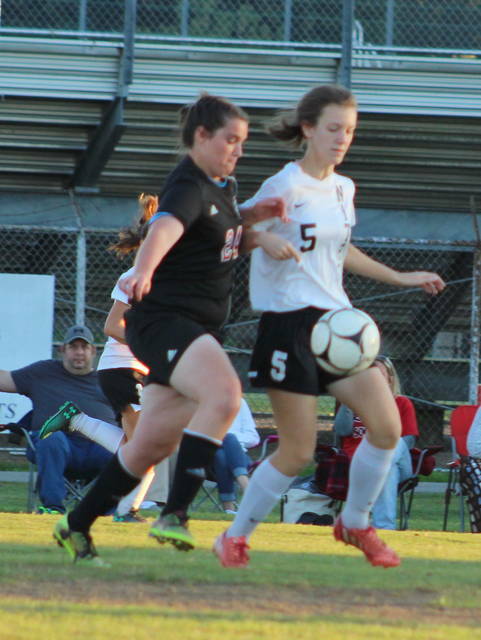 The Lady Wildcats (13-7-2), on the other hand, made the most of their limited chances — and may have also had a little luck along the way. Scoreless through nine minutes of play, NHS — attacking with the sun directly behind it — had a open look near midfield. Elora Shinn lofted a shot attempt high in the air from 40 yards out, which eventually came down in the top right corner of the net. The sun may or may not have hampered the reaction time by Point keeper Monica Cook, but the ball ended up out of her lunging reach as the Lady Cats took a 1-0 advantage with 30:36 remaining in the first half. The score remained that way until the break, although PPHS had four opportunistic shot attempts by Teagan Hay that each just missed the mark. The Lady Knights held an 8-3 shot advantage at the break, which included a 5-1 edge in shots on goal. Point Pleasant’s best scoring chance — at least at that point — came a minute into the second half following a crossing pass from Caitlin Peal to Hay right in front of the net. Peal’s pass went left to right towards Hay, who could only get a left foot on the ball at point-blank range. 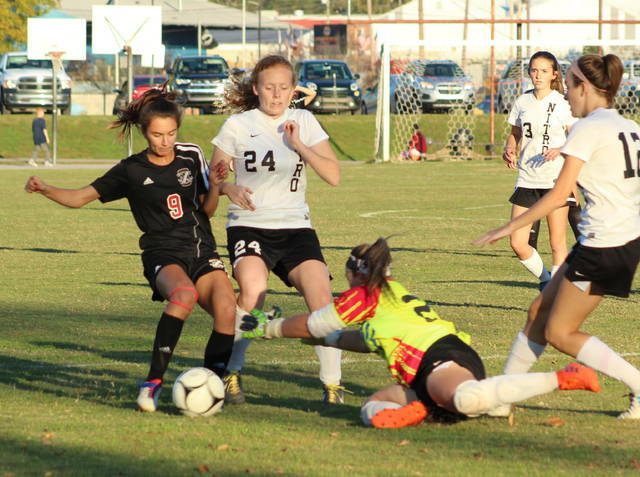 Hundley made a miraculous diving save to wipe away the goal, leaving the Lady Cats clinging to a 1-0 edge. The Lady Knights, however, finally broke through on their 13th shot attempt of the night as Ashley Smith sent a crossing pass from the right side that missed Hay and ended up on the foot of Morgan Miller. Miller blasted the shot attempt from the left side just past Hundley, allowing the guests to tie things up at one with 16:27 remaining in regulation. Nitro countered with the game-winner with 9:49 remaining as Shinn buried a penalty kick to the low right side of Cook, allowing NHS to secure a 2-1 cushion. It was a tough way to see the season come to an end, but PPHS coach Chris Errett was proud that his troops put up such a remarkable effort in their eventual season finale. Thursday’s end result also marked the final game for seniors Grace Lee, Alex Warden, Ashley Smith, Caitlin Peal and Faith Cook in the Red and Black. The Lady Knights and Nitro were both called for six fouls in the game, with the lone yellow card going to the guests. Nitro secured a slim 2-1 edge in corner kicks. 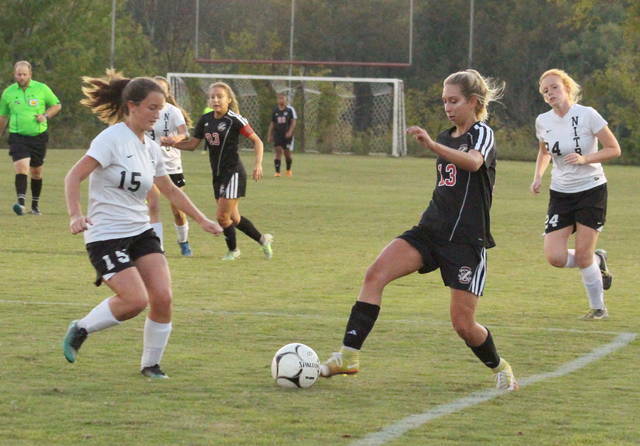 Cook made four stops in goal for the Lady Knights. Hundley stopped 13 shots in the NHS triumph.